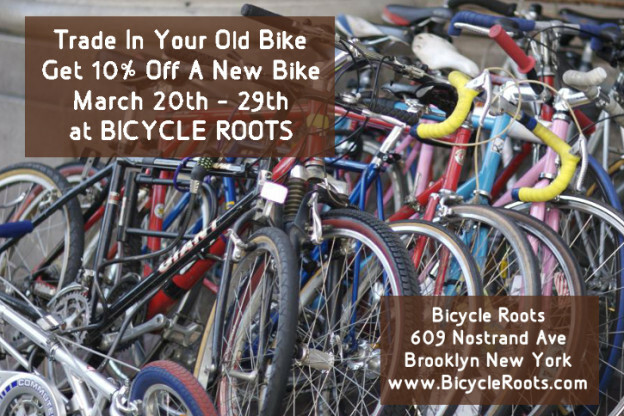 Now through March 29th only: Get 10% Off any new bike when you bring your old bike to Bicycle Roots as a Trade In. We’ll donate your Trade In bike to Recycle-A-Bicycle, an awesome Not for Profit that provides environmental education and bike industry job training to young people. R-A-B runs Earn-A-Bike, Green Jobs Training, and Summer Youth Employment Programs, as well as High School Internships, Recycled Arts Workshops, and a Kids Ride Club. Our own co-owner Joe Lawler got his start at one of their job training programs when he was just a young pup, and look how far it got him! 03/16/15 Update: Thank you all for making our sale a huge success. 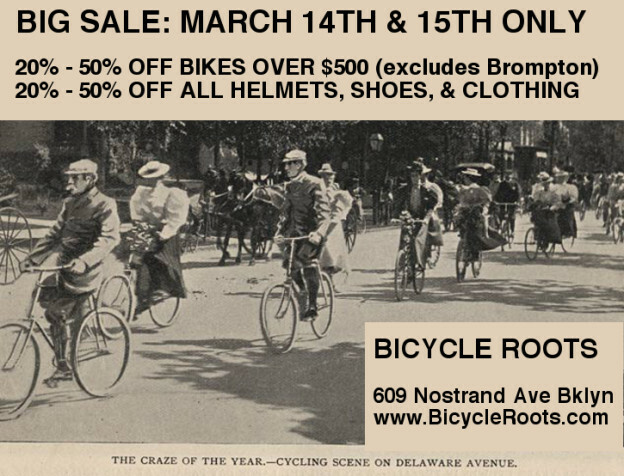 Our brick and mortar store is closed on Mondays, but we’re extending these sale prices for one more day on our online store, BicycleRoots.com. So if you couldn’t make it into the store over the weekend (we know, it was raining), you have one more day- that’s today, Monday 3/16/15, until midnight- to get 20% to 50% off bikes, helmets, shoes, and clothing when you shop at our website. We ship nationwide and we also accept in store pick up. The only exception is bicycles; bicycles are available for in store pick up only. Any questions? Please, Contact Us. Spring is just around the corner, and we’re offering a special deal on Commuter Bike Tune Ups in the month of March. Get $20 Off your next Commuter Bike Tune Up with the coupon below. Did you know that winter is the best time of year to invest in a new bike? Shop now to avoid the crowds that throng to our store in the Springtime, and to get a great sale price on a 2014 model year bicycle. 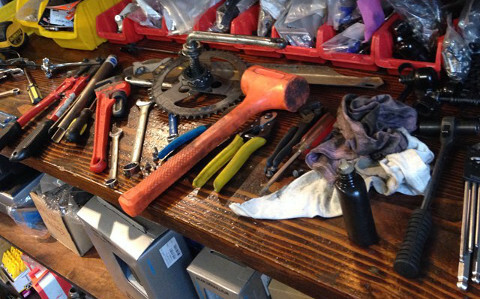 Did you know that if you ride your bike regularly, it needs to be tuned up twice a year? Regular tune ups will keep your bike running smoothly and safely. At Bicycle Roots, we offer a comprehensive tune up package priced at $75 for multi-speed bikes, $55 for single speed bikes. Now, for a limited time, you can get $20 off your next tune up by using the coupon below. That means we’ll tune up your multi-speed bike for $55, and your single speed bike for $35. Give A Bike. Get A Bike. Your kids want bikes for the Holidays. But what will you do with the bikes they’ve outgrown? Did you know that you can donate your children’s old bikes to local kids in need? By doing so, you will make space in your home, and more importantly, you will share the gift of cycling with a child who would not be able to experience it otherwise. This holiday season, Bicycle Roots has partnered with Baby G’s Community Toy Drive to collect bikes and toys that we will distribute to local kids in need. Now we need your help to make our toy drive a success! Now through December 22nd, donate a used kid’s bike at our store and get 10% off your purchase of a new kid’s bike! 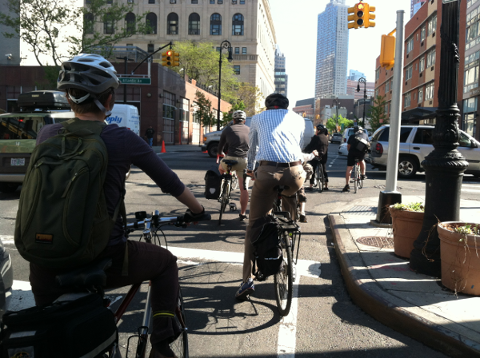 At Bicycle Roots, we’re here to help you use your bike for transportation. Lots of our customers bike to school, bike to work, and bike to go shopping. So when the leaves start to turn colors and there’s a chill in the air, we all start thinking about BICYCLES! This Fall, we’re holding a big Back To School sale to help you get the gear you need for cycling. Our Back To School Sale begins NOW and ends at 11:59pm on October 31, 2014. We’ve got great deals on Bikes, Clothing, Bags, and more.